Sotheby Parke Bernet, Hong Kong, 2 November 1978, lot 103. Canadian Craft Museum, Vancouver, 1992. Liu Baojun seems to have been a scholar-artist who was not a prolific painter. 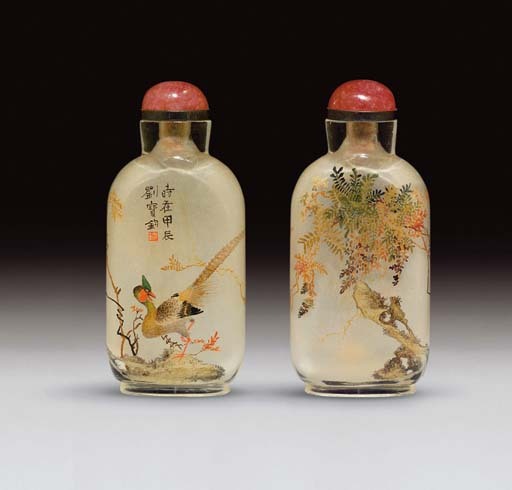 There are only seven known inside-painted bottles by his hand, all dated to either 1904 (six examples) or 1907 (one example). Three of the known examples are in the Meriem collection, and are the most impressive of them all. See B. Stevens, The Collector's Book of Snuff Bottles, no. 831, for an example by Liu with birds in flight.